This generously proportioned family home offers plenty of space throughout its five bedrooms and three bathrooms along with a good size sitting room connecting to a separate dining room. The kitchen/breakfast room is large enough to accommodate a table. There is a separate study and useful utility room along with a downstairs cloakroom and integral double garage with electric up and over doors. The property also enjoys a level mature rear garden enclosed by wall and fence to provide privacy, a double width driveway providing off road parking, gas central heating via radiators and leaded light double glazed windows to add to the property's attractive appearance. The property is set within the very popular Moat Farm development on the south side of Tunbridge Wells and therefore we have no hesitation in recommending an early appointment to view. ENTRANCE HALL: Double radiator, power points, coved ceiling, understairs storage cupboard. DOWNSTAIRS CLOAKROOM: Low level WC, wall mounted wash hand basin, half height tiling to walls, coved ceiling, single radiator, vinyl tiled floor. 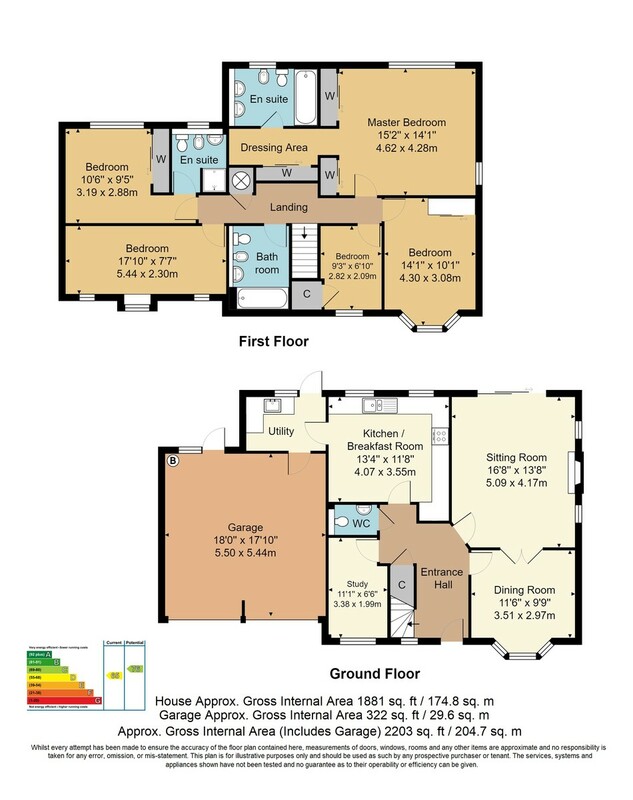 STUDY: Single radiator, coved ceiling, power points, telephone point, window to front. SITTING ROOM: Fireplace with fitted gas coal fire, coved ceiling, power points, double radiator, single radiator, wall lighting, two windows to side. Patio doors with fitted vertical blinds opening to the rear garden. UTILITY ROOM: Fitted with a range of units and worktops, stainless steel sink unit with mixer tap, space for washing machine and fridge/freezer. Tiled floor, coved ceiling, access to small loft area, radiator. Window to rear, part glazed door to garden and personal door to garage. Coved ceiling, power points, recessed airing cupboard containing hot water tank. Access to loft space. EN-SUITE BATHROOM Twin pedestal wash hand basin with mixer taps, bidet, low level wc, panelled bath with mixer tap and wall shower spray, tiled shower area and half height tiling to walls. Window to rear, double radiator, shavers point/light. BEDROOM 2: Window to rear, double radiator, coved ceiling, built-in double wardrobe with mirrored sliding doors, tv point, power points. EN-SUITE SHOWER ROOM: Low level wc, bidet, pedestal wash hand basin, shower cubicle with plumbed in shower. Window to rear, double radiator, shavers point/light. BEDROOM 3: Bay window to front, double radiator, power points, built-in double wardrobe. BEDROOM 4: Three windows to front, coved ceiling, power points, tv point, two radiators. BEDROOM 5: Window to front, single radiator, power points, built-in single wardrobe. FAMILY BATHROOM: Low level WC, bidet, pedestal wash hand basin, panelled bath with mixer taps and shower spray, coved ceiling. Window to front, single radiator, tiling to shower area and half height tiling to walls, shavers point/light. OUTSIDE REAR: Paved patio area to garden being mainly laid to lawn surrounded by flower beds and borders, wall and fencing provides the garden with privacy which benefits from a southerly aspect. Small pergola, outside light and tap. Timber summerhouse, side access to front. FRONT: Open plan garden being mainly laid to lawn with shrubs and plants. Path to entrance, double width driveway leads to an integral double garage with two single electric up and over doors, internal power and light, wall mounted 'Worcester' gas fired boiler, window to rear and part glazed door to garden. SITUATION: The property is located on the highly desirable southern side of Royal Tunbridge Wells approximately 1 mile from the mainline station which provides service into London. The main town centre itself offers a wide variety of shops, restaurants and bars. The historic Pantiles famous for its pavement cafes and bars is host to a number of activities including the Farmers market and Jazz evening, whilst other recreational facilities include local parks, two theatres and a selection of sports clubs including Rugby, Tennis and Golf. There is access to a wide range of excellent schools for both boys and girls catering for all age groups.